Fractures in the foot and toes are often caused by overuse and are commonly seen in athletes involved in high impact sports. They can be quite painful but often heal through conservative treatment. There are two types of fractures: stress and bone fractures. A stress fracture is a small crack in the bone and typically occurs in the weight bearing bones of the foot. Sudden increases in duration or intensity of exercise and improper training can cause a stress fracture. Having osteoporosis or another disease that has weakened bones can also put a patient at risk for stress fractures from doing simple daily activities. Other fractures can extend through the bone and are typically caused by trauma to the foot or a twisting injury. With a bone fracture, bones can remained aligned or be displaced and can be closed or open depending on whether the bone breaks through the skin or not. In any type of fracture, a patient will experience pain, swelling and often bruising. It is advised that treatment is sought immediately upon injury to prevent even further injury that could compromise the long-term health of the foot. Typically occurring in children and young adults, osteochondromas are benign tumors that develop beneath the toenail. They are generally not painful although they can result in ingrown toenails, deformities to the toenail and irritation to the surrounding tissue. If necessary, they can be surgically removed. Shin splints cause a patient to feel pain on either side of the leg bone from the inflammation of muscles and tendons. Shin splints are associated with pronation, a collapsing arch or a muscle imbalance between opposing muscle groups in the leg. Patients are encouraged to properly warm up and stretch before and after exercise. The use of custom orthotics has also been proven to be very effective in preventing shin splints. 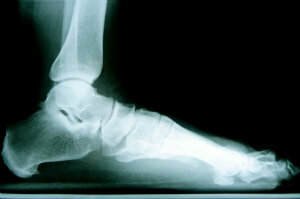 A sprain happens after an unnatural twisting of the anklebones. Ligaments on the outside of the ankle are stretched or torn resulting in swelling and bruising. The severity of the sprain will dictate the type of treatment needed and length of recovery. Rest, ice, elevation and bandages will often be effective in helping to reduce swelling and support the ankle during healing. If the sprain is severe, surgery may be needed to repair damaged ligaments in order to bring full function back to the ankle. A broken ankle is also called an ankle fracture and can vary greatly in severity. Patients often mistake a fracture for a sprain when they can still walk on the injured ankle. The ankle has two joints and three bones. A fracture can be a single break in one bone or several fractures that can put your ankle completely out of place and impact connecting tissues and ligaments. Due to the swelling, pain, tenderness and sometimes dislocation, a leg cast or brace is often used as first form of treatment. Surgery may be required to secure bones in place in severe fracture cases. Osteochondritis is typically caused after an injury to the ankle. A twisting of the ankle can result in lesions that result in pain and stiffness of the ankle joint. Immobilizing the ankle is typically very effective in helping the ankle to heal appropriately although in severe cases, surgery may be necessary. Timely diagnosis and treatment is key in restoring health to feet and ankles after an injury. Schedule an appointment with Dr. Danciger today if you have a foot or ankle injury that needs attention.